(Nanowerk News) Scientists at the University of Liverpool have shown that some atomic nuclei can assume the shape of a pear which contributes to our understanding of nuclear structure and the underlying fundamental interactions ("Studies of pear-shaped nuclei using accelerated radioactive beams"). The Standard Model of particle physics predicts that the value of the EDM is so small that it lies well below the current observational limit. However, many theories that try to refine this model predict EDMs that should be measurable. 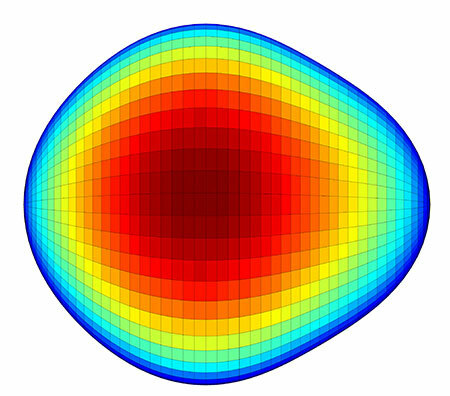 In order to test these theories the EDM searches have to be improved and the most sensitive method is to use exotic atoms whose nucleus is pear-shaped. Quantifying this shape will therefore help with experimental programmes searching for atomic EDMs. Professor Peter Butler, from the University’s Department of Physics who carried out the measurements, said: “Our findings contradict some nuclear theories and will help refine others. The measurements will also help direct the searches for atomic EDMs currently being carried out in North America and in Europe, where new techniques are being developed to exploit the special properties of radon and radium isotopes.